If you take a look at the current diamond market, it seems that diamonds really are ‘forever’ as well as a ‘girl’s best friend’. Today’s company certainly thinks so. This $10M capped ASX stock has just re-started one of only two diamond mines in Australia, to try and capitalise on what De Beers says is a market that has been higher over the past three years than in any other three-year period. And now, after a few years of preparation and significant investment, production at this company’s diamond mine just recommenced, and the company is busy ramping up operations now. Could this company uncover a few more one hundred carat rocks over the coming weeks and months? Of course, the answer to this question no one can say for sure – this is a speculative mining stock, and investors considering for their portfolio should seek professional financial advice before making an investment decision. 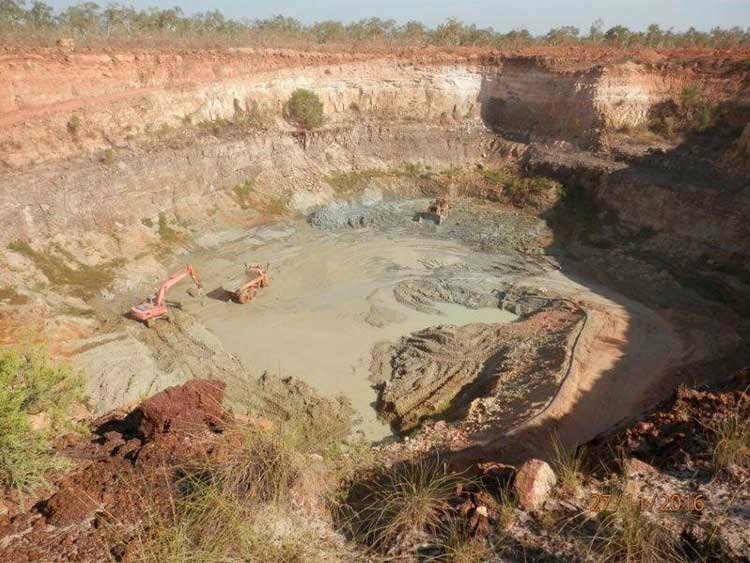 This Northern Territory mine was previously owned by Rio Tinto, then sold to ex-Rio employees before being picked up by this company as a distressed bargain in the wake of the GFC. This mine boasts an impressive historical production of 65% gem-quality, and is the second largest mine in Australia, surpassed only by Rio Tinto’s Argyle mine. Argyle’s diamond mine has only 5% gem quality, and with the global average being 20% gem quality, you get a sense of what this company’s mine may be capable of producing. Being capped at just $10M, with diamond production online now, it appears to have plenty of upside from current levels. For example, compare its market cap to another ASX diamond stock – Lucapa Diamonds. That is 13 times more than this ASX stock – which doesn’t attract the same sovereign risk discount as Lucapa. As we alluded to above, this company is also in the distinctive position that at any moment it could find a large high-value rock which could sell for millions of dollars. With 80 targets chosen via geophysical surveying plus the discovery of diamond indicator mineral anomalies, we could see this mine returning to its heyday, when it produced some 500,000 carats of high-quality diamonds in around 4 years with some of the best quality diamonds in the industry. 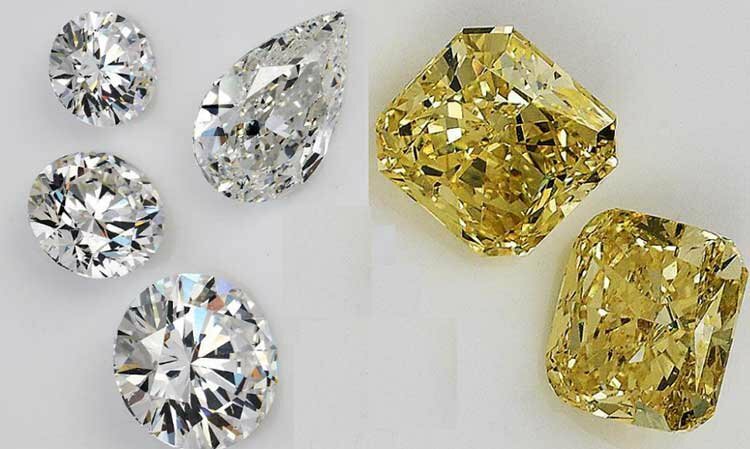 As an Australian play, the diamonds, when recovered and sold, offer a product with no blood or conflict to muddy sentimental value or deter the buyer; no question of it being swapped with artificial gems during international shipping. Just pure, home grown, high-value rocks. Its market cap of $10M suggests early investors could be buying into an overlooked resource with significant potential to return to its glory days. In its former life, the mine delivered over 2.2 million tonnes of ore which produced 507,000 diamond carats for Rio Tinto and Ashton Mining Limited across a 5-year span. Merlin Diamonds Limited (ASX:MED) is one of those companies with both short and long-term upside with a predicted mine life of up to 11 years from just two pipes: Kaye and Ector; never mind the other 11 pipes. For those new to diamond mining, pipes are geologic vertical structures that are indicators that there may be diamonds around. Mining has already commenced at the Kaye open pit , to supplement the ore stockpiles which are at site. 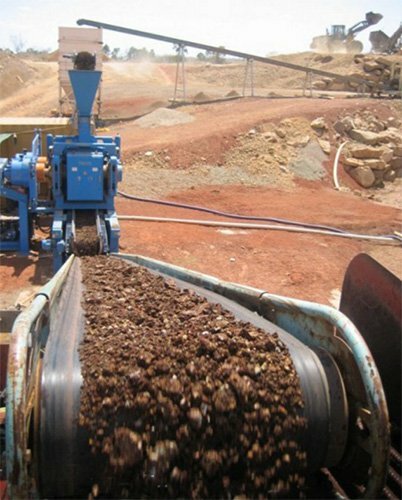 Approximately 16,000 tonnes of ore has been mined to date. Diamonds have demanded attention from human beings for generations. Whether you believe they are ‘forever’, a ‘girl’s best friend’ or you see them as religious icons like people did in Ancient India, one way or another you will be familiar with the high value that humans place on these eye-catching rocks. Some even to the tune of $83,187,381 – that’s the most anyone has ever paid for a gemstone, and it was for a 59.6 carat pink star diamond mined in South Africa. Diamonds have two main uses today – as decorative adornment and safe haven investment which is transportable (usually jewellery, that continues to carry cultural status regardless of market dynamics) and as industrial abr­asives for cutting tough materials (interestingly, such as polished diamonds) due to its intrinsic hardness. Yes, that’s why you see people acting out the diamond bite test in movies to check if they’re real. The other especially enchanting attribute of a diamond is the spectral colours it reflects; in fact, that’s a diamond’s primary gemmological characteristic, and it has enchanted people for millennia. The modern day is no exception – and MED intends to maximise on this. With a future buoyed by this global reverence and demand across two market uses, MED has set its sights on this $80 billion global diamond market . To be successful, obviously the company will need to pull diamonds out of the ground and sell them for a profit. Given the history of the mine, significant market penetration is a real possibility. While dormant for some time, operations at the Merlin mine recommenced with crushing and screening of stockpiled oversize material from previous operations adjacent to the plant having already commenced. Furthermore, the Dense Media Separation Plant (DMS) has also been successfully recommissioned, meaning that all operations are now fully active. With that in mind, let’s look at operations in more detail. What exactly has MED got? MED has some top end tenement holdings with excellent reputation in the market in the resource-rich Northern Territory of Australia, including Arnhem Land, as well as in WA in the North Kimberley – about 22,000km 2 in total. It is prudent to point out here that mining of its Kaye pit at the Merlin diamond mine in this region has begun. 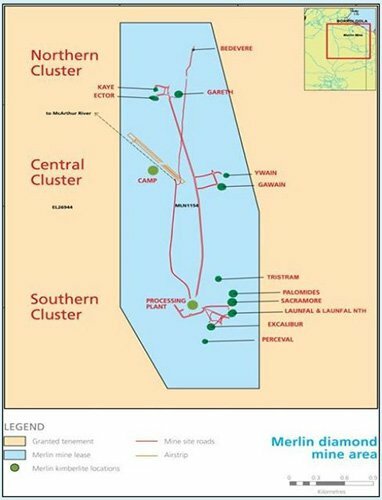 As you can see from the map above, this land covers extensive exploration ground in and around the Merlin diamond mine, with MED actively working to extend its exploration in this region for additional sources of diamonds. However, it is MED’s holding in the Borroloola Project Area, where the Merlin Diamond Mine sits, which is most prospective and has already proven to be lucrative. 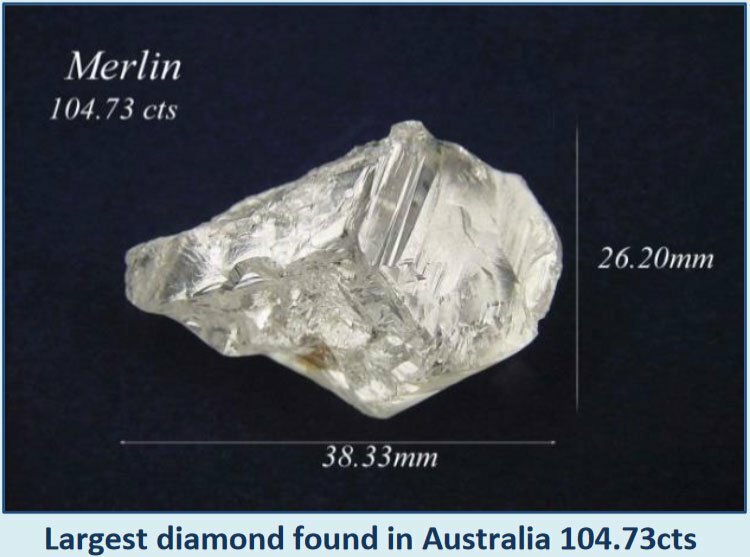 The Merlin Diamond Mine was where Australia’s largest diamond – measuring 104.73 carats – was found and where MED hopes to find a potential motherlode of similar quality stones. 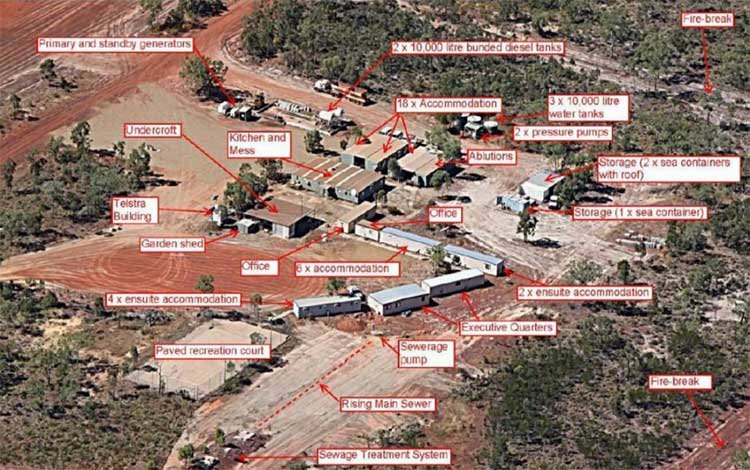 The Merlin mine is about 90km south of Borroloola and 725km SE of Darwin, located in the Batten Trough of the southern McArthur Basin in NT. As you can see from the map below, the company has significant land from which to commence production in the near term and continue to explore in the long term. To give you a little bit of history, the Merlin kimberlite field was discovered by Ashton Mining Ltd after systematic exploration between 1991 and 1994. After periods of trial mining and feasibility studies Ashton Mining Ltd was taken over by Rio Tinto Ltd.
MED acquired Merlin in 2008, during the GFC, after distressed vendors bought it from Rio Tinto when it failed to fit into Rio’s forward thinking plans – in essence the mine wasn’t large enough for Rio to proceed with it, however it has grown significantly since then. The timing of MED’s acquisition meant it snagged a quality asset at a discounted price given the market conditions at the time. Throughout this time resource definition drilling and trial production has increased the known JORC Code compliant Resource of diamonds. Feasibility studies examining options to enable near term production at Merlin were commissioned, including into the application of borehole mining as a means to reduce costs associated with overburden stripping required for open cut mining, and related capital costs. As a result of these studies, the company applied for and was granted an MMP which enabled it to recommence diamond production in 2013. ... and things are now well underway, with the company’s latest update claiming that diamonds are now being recovered on a daily basis . From the map above, you can see the Merlin Diamond Project is located some 100 km south of the settlement of Borroloola. 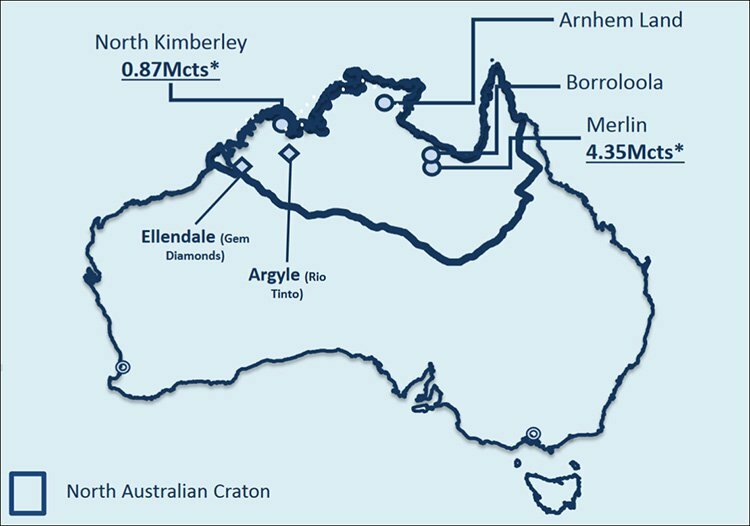 It comprises 13 kimberlite pipes on the Merlin mine lease, in three separate clusters (kimberlites are igneous rock known for containing diamonds). Ten of these kimberlites which remain amenable to open pit mining have been mined to date, (and grouped into four clusters) nine of these kimberlites were subject to open-pit mining over a 5 year period commencing in 1998. 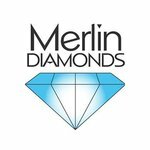 When operations ceased in 2003 – having produced 507,000 carats of diamonds during its short operational life – the Merlin diamond mine was renowned for the production of top quality white diamonds and large specials. The total Merlin JORC compliant combined Indicated and Inferred Mineral Resource is 19 million tonnes for a contained 4.3 million carats, and the total Merlin JORC compliant Probable Ore Reserve is estimated at 11.1 million tonnes for a contained 2.9 million carats. This puts Merlin as the second largest Mineral Resource and Ore Reserve in the country. 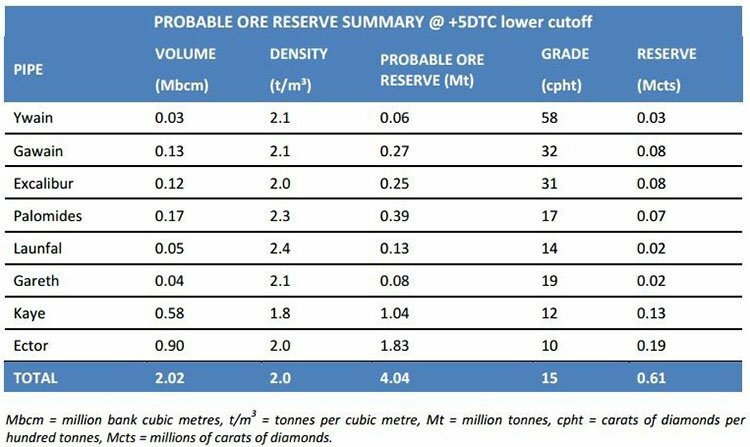 The Probable Ore Reserve has been estimated on mechanical clamshell mining methods and is the result of the feasibility study completed in September 2014. MED’s holding in Arnhem Land is highly prospective but as yet not explored. 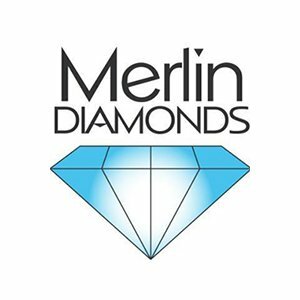 The Merlin mine is one of only two diamond mines in Australia and operated from 2000-2003 producing a high proportion of top-quality diamonds. The company has 80 targets identified via geophysical surveying as well as diamond indicator mineral anomalies. The average of gem-quality diamond production at diamond mines globally is 20%. Merlin has 65% historically – eclipsing most rivals. The remaining 35% are classified as near-gem or industrial quality. 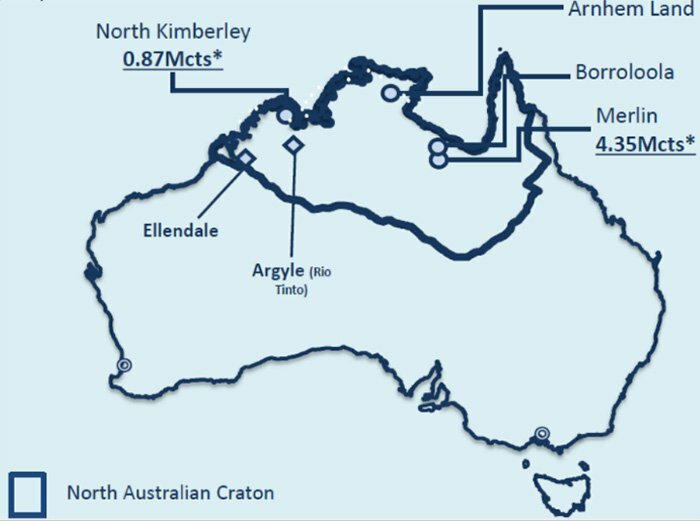 Australia’s largest diamond mine, Argyle, only boasts about 5% gem-quality. Within the three clusters at Merlin mine – a northern, central and southern cluster – are rough diamonds, both white and yellow, renowned for their size and quality. MED sold parcels of rough diamonds from their 2010 production trials, generating US$1.865M. At the end of the last quarter, MED had around $1.1M in cash . Diamonds can be mined either through directly tapping into kimberlite ‘pipes’ – the vertical structures, thought to form from the earth’s mantle, often creating diamonds in the process – or through mining waterways flowing in or around these pipes. Kimberlites tend to be the far more lucrative option for recovery of gems. And the good news is, the previous owners had already done a fair bit of the leg work in terms of exploration. Some strategic upgrades have been implemented to improve the washing, crushing and screening process, which will assist in keeping ongoing costs down. The Dense Media Separation (DMS) feed bin, which came with the site, will be used to produce heavy concentrate of diamonds which will then feed directly into a new final recovery unit which should be more efficient. The team will use Flowsort machines acquired from the nearby Ellendale diamond mine. This should improve productivity and security. Here’s a photo of the modern mobile and screening equipment, contracted by MED, on the ROM pad at Merlin Mine. The first step is to process the stockpiles of oversized ore at the site from previous projects. All stockpiles are close by the plant which makes it quite straightforward for MED to start production with a few early and easy chunks of revenue-making diamonds. The operation kicked off in October. This is a region known for its high prospectivity – and MED is only just getting started. 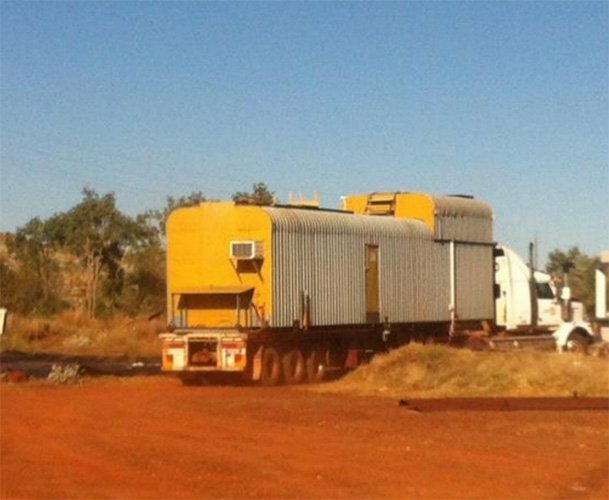 While we’ve focused mostly on the Merlin mine project near Borroloola, and it is MED’s key focus at the moment, its other tenement holdings could get additional focus once the company establishes a healthy cash flow from Merlin. In the North Kimberley region of WA, the company holds three mining leases which include the Ashmore and Seppelt diamondiferous kimberlites. The majority of the licence applications fall on land controlled by the Arnhem Land Aboriginal Land Trust. 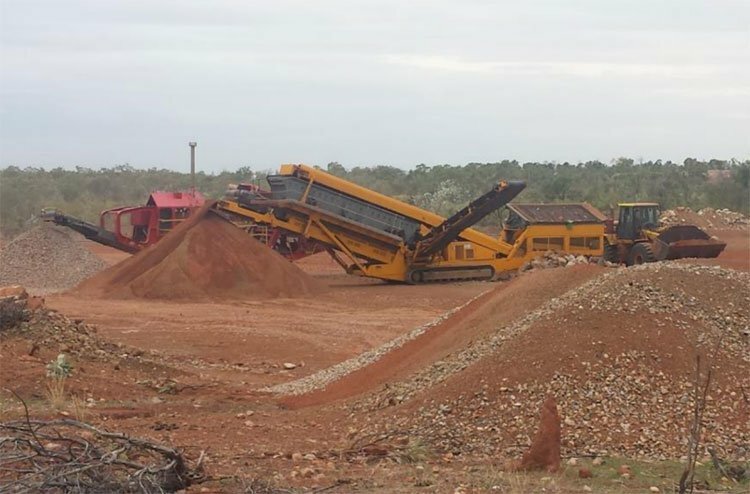 MED has farmed out the non-diamond rights for most of the applications to Top End Mineral Limited, who are responsible for negotiating with the Northern Land Council (NLC). The plan for MED is to eventually collect diamond exploration samples on licences granted as a result of these initial negotiations between Top End Mineral Limited and the NLC. Investors will likely be watching to see how this process unfolds in the coming 6-12 months. According to the Antwerp World Diamond Centre (AWDC) and management consulting firm Bain & Company, the supply of rough diamonds is expected to decline by up to 2 per cent a year between now and 2030. No one can ever predict with strong accuracy the future demand for goods that aren’t essential – but diamonds have certainly stood the test of time up to now. Some of the major producers have been keeping supply at a reduced level to assist with sustaining market profitability in the years since the GFC, during which time an oversupply has left some retailers and producers stuck with extra stock. The hit the diamond industry took in that time also means that, as a result, there are and will likely continue to be less diamond producers around. Quite a few analysts are predicting future shortages, which would lead to higher prices... which makes the funding of further diamond mining and exploration more achievable for those still in the game. The current factors seem to be predicting demand to head north in the long-term. And that’s exactly the kind of game MED is hoping to play, particularly with some predicting that demand will outpace supply starting from as early as 2019 . Driven by the ongoing recovery in the US (a huge market for diamonds) plus the growth of the middle class across large countries like China and India – the company could be looking at an easy profit once it gets past the first few years. But keep in mind, MED is a speculative stock, and it remains to be seen how many diamonds the company can find or whether it can extract them for a profit. You should seek professional financial advice before considering an investment. “In America, it’s bling bling. 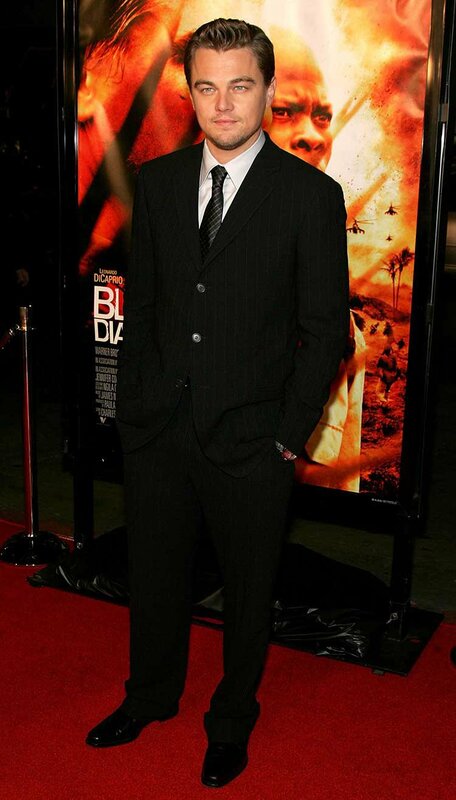 But out here it’s bling bang.” So Leonardo DiCaprio says in the 2006 film Blood Diamond . His character, Danny Archer, was involved in the diamond smuggling business in the 1990s which saw the illegal passage of ‘conflict diamonds’ from Sierra Leone to Liberia. 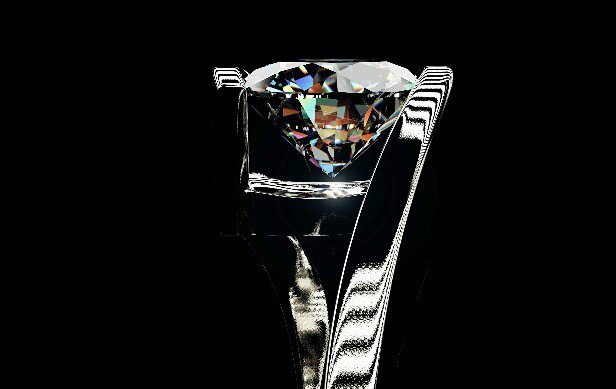 ‘Bling bang’ is in reference to the fact that in western societies where diamonds are purchased as gifts and worn as jewellery, it’s called ‘bling’ – in stark contrast to some developing nations where diamond mining has led to war. Hence the ‘bang’. ... sparked a flurry of public awareness and curiosity about where our favourite romantic gem comes from. The notion of ‘blood diamonds’ or conflict diamonds has received a fair bit of media coverage in Australia and beyond – and MED offers a real alternative to the unethically sourced diamonds which some buyers have become (understandably) disenchanted with. High quality gems from Australian soil, sold through auction and created by an Australian jeweller – that’s a nice story, but a bit of a dream to many people who’ve searched in vain for an ‘ethical’ engagement ring. So you can see some of MED’s strong selling points here. And that’s before even mentioning the historically high grade of the diamonds. The best way to provide capital growth for investors is to sell the precious goods it has worked hard to unearth. MED expects to recover larger diamonds, which are customarily sold in rough form at tender, and in this case likely through the vast Antwerp diamond market. Given the conditions outlined above, a tender could be perfect for securing the highest prices possible. Considering the largest diamond found in Australia was at Merlin, you can see how this is a potentially profitable game plan. At the same time, MED’s diamond production is still in its early stages. Potential investors should do their own research before making a decision regarding this stock. With the help of its consultants ‘Foundation Resources’ in Perth, who has worked on a variety of diamond projects around the world – Botswana, Angola, DRC, Indonesia, South Africa and Namibia – MED is confident of producing a big haul of one of the world’s most sentimental (and highly priced) rocks. With all of these factors under consideration, and assuming there are no surprises, MED is looking to significantly increase its $10M valuation over the coming months as production ramps up.